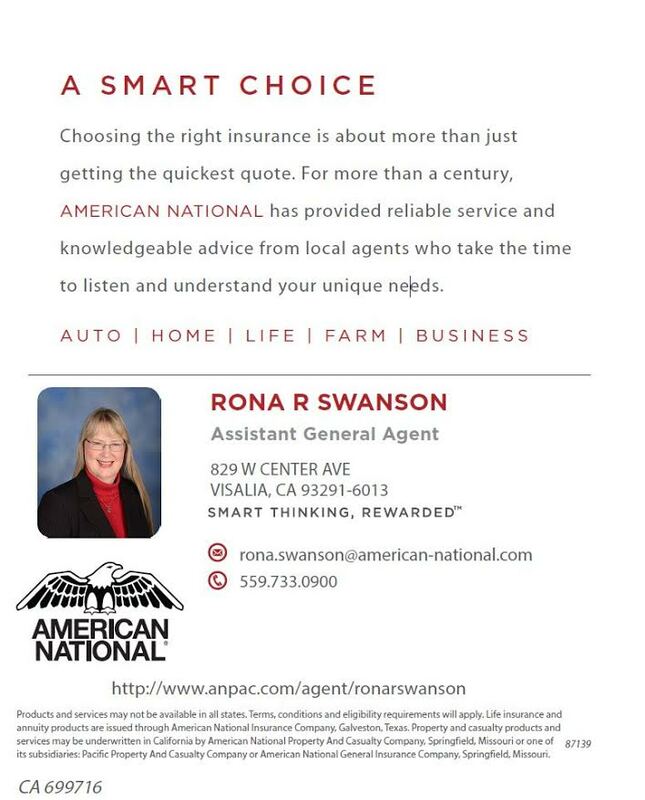 Blog Thank you Rona Swanson! “On February 28, I will hit my 31 year mark representing American National Insurance Company. Before I became an insurance agent, I was a full-time stay-at-home Mom (and I was really good at it). I had to get a job when I went through a divorce. I had three little children to provide for and found a job as a secretary at American National Insurance Company. I scheduled appointments and filled out applications, but I did not receive commissions. So I asked, could I get licensed too? I had to take two licensing tests and got my license and started my career. We lived up in the foothills and I cried and prayed all of the way down to Visalia every day, sad to leave my children but looking to God. I did not know a soul in Visalia so I drove through neighborhoods and looked for Hot Wheel trikes and children’s toys in the front yards, then I would go back and look them up in the directory. Thankfully, there were gracious people who agreed to meet with me. Recently I found my first appointment book from the year 1986. It cost about 49 cents and was from Gemco (the pre-cursor of Target). Some of the names from my first appointments are dear friends now. I look back over it and marvel at how God led me to them, and how He connected us and allowed me to help them. I made a living, but even more it has made my LIFE. I have listened to Spirit for years, but an event in 2004 changed everything for me. My youngest daughter Rebekah was going to graduate with honors from Fresno Pacific with a double degree in English and Psychology. She planned to pursue her Master’s Degree in England and she had taken a job at Borders in order to be able to transfer to a Borders store in the UK. It was on her way home from Borders one night that her car left an upper tier of freeway, smashed into the middle tier and broke in two to fall the rest of the down to 41. Rebekah died instantly but, miraculously, no one else was harmed. In the aftermath, the music of Spirit was like a soundtrack for me….same as it had been before. So many songs that Rebekah and I would belt out together. I remembered her tear-glistened face with I Can Only Imagine and her hilariously quirky dance moves to Switchfoot’s Gone. So I became a contributor. And then a day sponsor. My goal has been to share the truly joyous news that no matter how shattered, no matter how broken, no matter how ruined we can feel, God is bigger and able to put us back together. I wondered whether I would ever know joy again….and learned that the JOY of the Lord IS our strength!